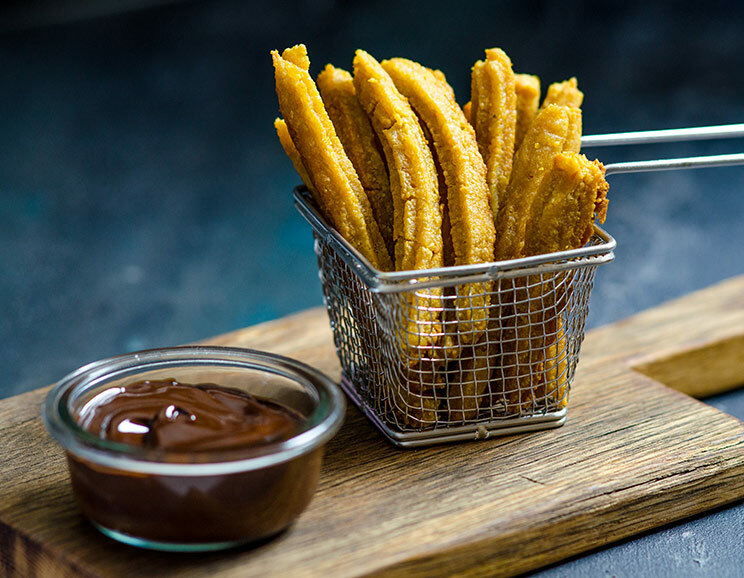 Bite into these crispy sweet potato churros dunked in a rich, dark chocolate sauce. Everyone loves crispy, doughy churros, but all too often these treats are full of gluten and coated in refined sugar. To give these classic Mexican treats a Paleo twist, we made a batter using sweet potatoes and gluten-free flours, deep fried them in coconut oil, and dunked them in a pot of antioxidant-rich dark chocolate sauce! This recipe uses sweet potatoes as the base of the churros. To make the sweet potato purée, bake the potatoes (skin on) at 350°F for about 40 minutes, then cool, peel and blend until smooth. We recommend doing this step ahead of time. 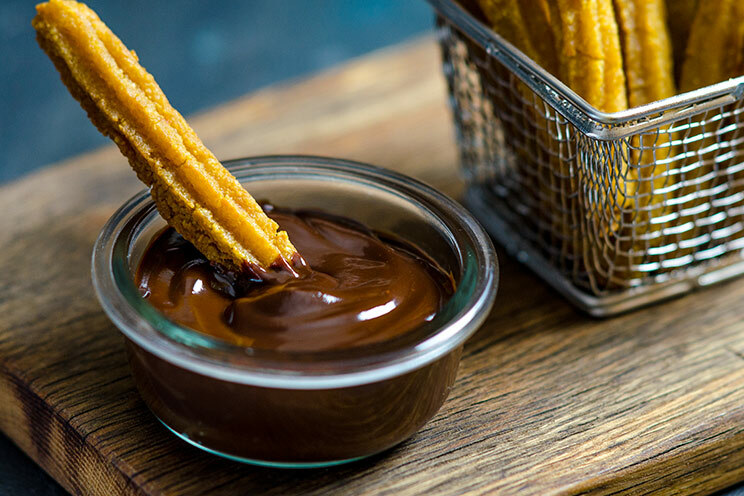 No churro is complete without a decadent dipping sauce! To make the creamy sauce, simply melt raw dark chocolate in a double boiler, remove from the heat, then stir in coconut cream and honey until combined. These crunchy sweet potato churros are great for parties – simply triple the ingredients to serve a big crowd. To make the chocolate sauce, place a small bowl over a saucepan of simmering water. Add the chocolate to the bowl and stir to melt. Turn off the heat and stir in the coconut cream and honey. Place in a small serving bowl and set aside. To make the churros, heat the butter and sweet potato purée in a large saucepan over medium heat. Reduce the heat to medium-low and add in the almond flour, tapioca flour and baking soda, stirring constantly, until it makes a smooth paste. Remove from the heat, then add one egg at a time, beating well with a wooden spoon or a hand mixer, until the eggs are incorporated. Add the batter to a large piping bag fitted with a star tip. Heat the coconut oil in a deep saucepan. Once it’s really hot, pipe out the churros into the oil, cutting them with scissors as you go. Deep fry about 2 minutes per side. NOTE: Be careful, the coconut oil will be hot! Remove from the heat and serve with dark chocolate sauce. You can deep fry the churros in a wok or small skillet instead of a saucepan if you prefer to use less coconut oil. Store leftovers in an airtight container at room temperature. Reheat in the oven for 5 minutes at 350°F before serving.